3D printed buildings…on the moon? If you aren’t familiar with TED, get with the times. Recently on TED, Behrokh Khoshnevis, a Professor of Industrial and Systems Engineering at the University of Southern California, talked about one of his projects called Contour Crafting. 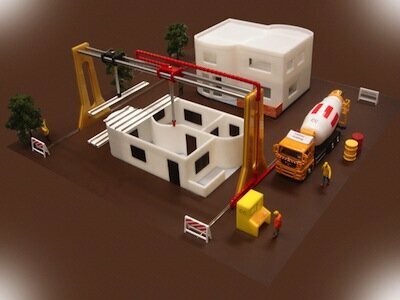 The idea is simple: manufacture houses (and other buildings) with 3D printers, on site. Obviously there are technical issues to address, but basically Khoshnevis wants to scale existing 3D printing technology big enough to print any size of buildings. Computer aided design and computer aided manufacturing, or CAD/CAM, an automated method of design and manufacturing, is already used to produce most consumer goods, such as clothing, electronics, and some cars. Khoshnevis aims to apply similar methodology to the archaic method of constructing houses, and he’s already built and tested a system that can print a hollow concrete wall that can withstand 10,000 psi, compared to the 3,000 of a traditionally built wall of the same size that takes more materials and time. Additionally, more complex structures and molding could be printed for less than with cheap and efficient (boring) rectilinear methods of construction. That is, your house could have domes, arches, and hexagonal honeycomb rooms for the same cost as a plain square box house, and every house on the block could look different. Welcome to Seussville. Khoshnevis has preliminary designs for multi-nozzled printers for large complexes like office buildings and apartments, and for tall jobs, printers that climb the building that they’re building. He envisions secondary systems that will automatically install plumbing and electrical wiring, while tertiary systems tile floors and paint walls. Like current small-scale 3D printing, printed houses will produce significantly less waste, have smaller carbon footprints and shorter construction times (Khoshnevis estimates that a 2,500 sq ft home will take about 20 hours to print), and require less human capital. Some will note that requiring less human capital implies less jobs, and Khoshnevis addresses the concern. In the same way that the Industrial Revolution lowered the amount of farmers needed without causing the country to collapse, printing houses shouldn’t either; and apparently it wouldn’t be so bad to have less construction workers, since around 10,000 of them die on the job every year (more than mining and agriculture), with another 400,000 injuries, just in the US. The costs of the medical expenses ultimately fall on homeowners. With all new technologies come new jobs, like installing and maintaining the equipment, and with less of the work being physically intensive, more women and elderly can fill construction jobs. Currently, there’s interest in using the technology to build moon bases, which is awesome, though I’d prefer they start a little closer to home.